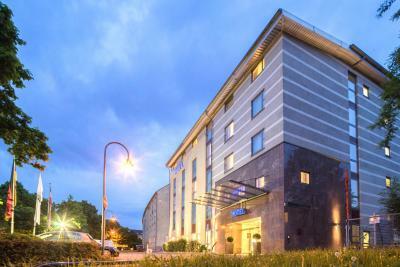 Lock in a great price for PhiLeRo Hotel Köln – rated 8.1 by recent guests! Very clean and comfortable. Friendly and professional staff. The hotel is nice and in a great location, but the only problem I had was the WiFi not working. The staff We're friendly and the hotel had a nice environment and were very comfortable. 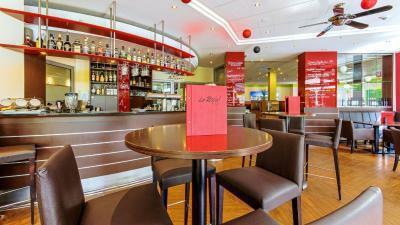 The check in was very quick, the staff were helpful. The rooms were very clean and nice and spacious. Great service, very professional and friendly staff. A bit far from the city center but just 5 stops from the Heumarkt station and it was okay. Free hot drink service (coffee and tea) at the entrance was very nice. Lovely large clean rooms, little touches on arrival made my partners birthday trip extra special! It’s a little farther out of the centre, however only a few stops by train, which was close and very easy to use! Location was good was not in the centre so it was quiet but also ideally located next to a tram station about a 5 min walk which made transportation easy. There are supermarkets within an 8 min walk as well as an excellent brewery (sunner keller) and some bakeries nearby! 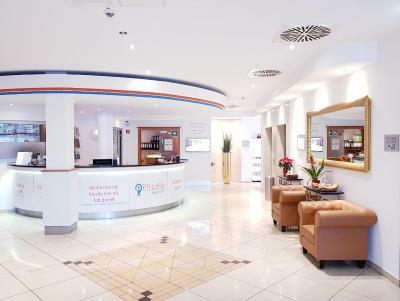 PhiLeRo Hotel Köln This rating is a reflection of how the property compares to the industry standard when it comes to price, facilities and services available. It's based on a self-evaluation by the property. Use this rating to help choose your stay! 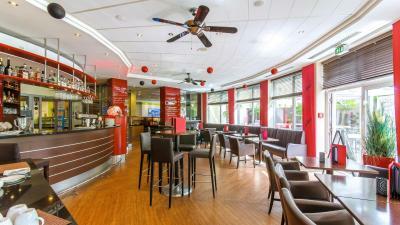 One of our top picks in Cologne.Offering free WiFi, this 4-star hotel is located in the Höhenberg district of Cologne. 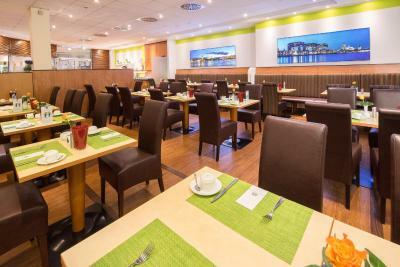 It is 1.5 mi from the popular Lanxess Arena, and the Kalk Kapelle Underground Station is only an 8-minute walk away. The PhiLeRo Hotel Köln is a completely nonsmoking hotel. 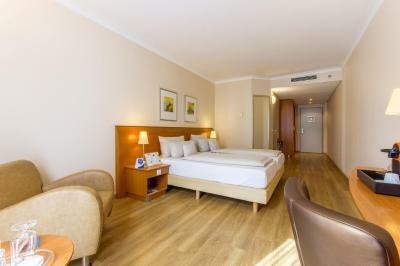 It provides air-conditioned rooms and suites with flat-screen TVs. An air purifier is also available on request. Guests can use the hotel's shared internet terminal. 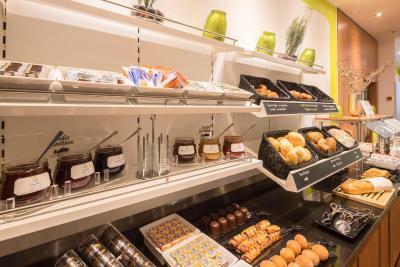 Takeaway tea and coffee are available in the lobby 24 hours a day at no extra cost. 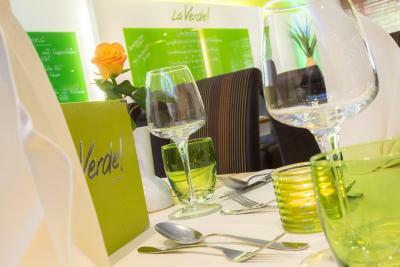 The in-house restaurant, La Verde, is set in a modern design and serves snacks and delightful Mediterranean-inspired dishes. 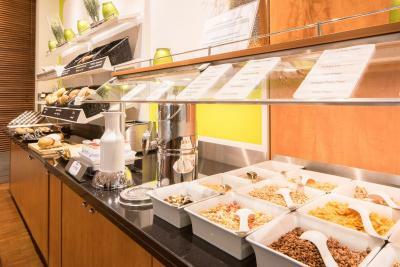 All food served is fresh, seasonal and handmade, and no pre-prepared ingredients are used. 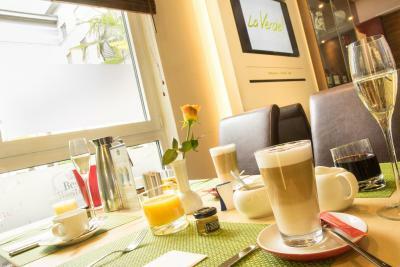 A large breakfast buffet is available in the mornings, and coffee specialties are included in the breakfast. The A3/A4 motorway is only 0.9 mi away from the PhiLeRo Hotel Köln. The Cologne Trade Fair is 2.5 mi from the property. The train station Köln Deutz is 2.1 mi away. 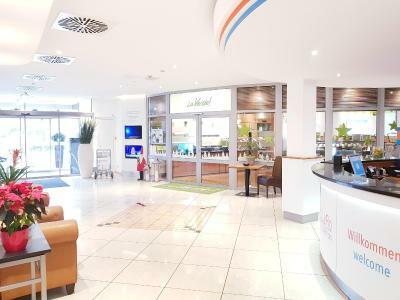 Cologne Bonn Airport is a 15-minute drive away. A limited number of free public parking spaces are available. There is also a charging station for electric vehicles. Kalk is a great choice for travelers interested in city trips, city walks and old-town exploration. 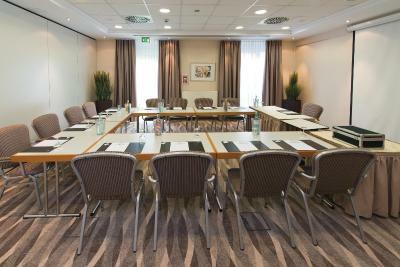 When would you like to stay at PhiLeRo Hotel Köln? Homelike room with a flat-screen TV, seating area and private bathroom with complimentary toiletries. Please note one extra bed for a child is possible in this room category. 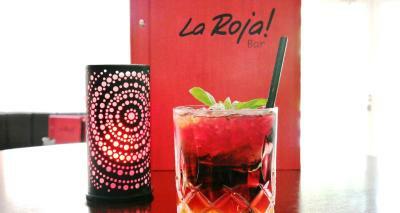 Offers extra space, garden views, free mini-bar, 1 welcome drink and one reserved underground parking space. Please note 2 extra beds for 2 children are possible in this room category. 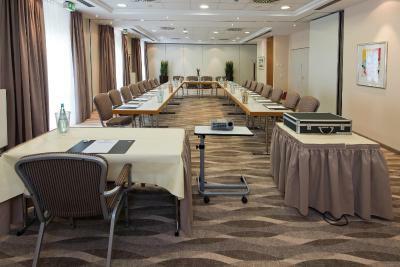 House Rules PhiLeRo Hotel Köln takes special requests – add in the next step! Free! One child under 13 years stays free of charge in an extra bed. 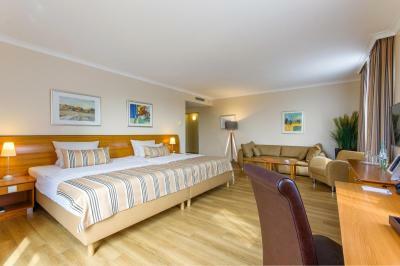 One child from 13 to 16 years is charged EUR 39 per night in an extra bed. PhiLeRo Hotel Köln accepts these cards and reserves the right to temporarily hold an amount prior to arrival. Please note that outside of trade show periods and events, the restaurant is closed on Sundays and Mondays, and the bar is closed on Mondays. Changes might occur. Lack of facilities Nd location. Nothing really to complain about. Me and my friend walked from the shopping arcade to the hotel, which is just down one long road. We thought it would be about a 15 minute walk but weren't prepared how far it was. I would say if you were to go out in the evening, get a taxi back from the station due to the length of the walk. A bit distant to the city center but we knew it beforehand and it was okay. Nothing important. The lifts are very slow! 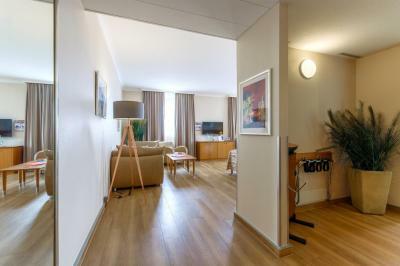 Clean, large room with good sockets and good free wifi. Good breakfast selection though some of the hot food looked a bit tired. Check in time could have been earlier normally it is at 3pm. Luckily I got into the room at 1:30pm. - Room without mini bar just to put a bottle of water. - Aircondition was down. The hotel is located in a very quiet place. Breakfast is enough good. Weird pillows, little too hot to sleep, had to open a window. One complimentary water bottle per 4 night stay, was not replaced. Somewhat distant from the train station - 15 min by taxi (€20). Added charges. 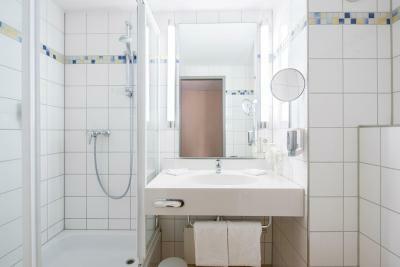 Quiet room, clean, good water pressure in shower, excellent breakfast, friendly staff.